Despite high housing costs, nearly half of Metro Vancouver’s population made less than $12,025 in 2010. It’s difficult enough to afford rent in Vancouver on that income, never mind setting aside enough to buy a home. Vancouver’s housing affordability “crisis,” as it has been dubbed by the media and planning experts, is especially worrying at a time when the area’s population is projected to increase to 3.2 million people by 2041. That would be a 39 percent increase since 2011, when Statistics Canada last conducted a census. Metro Vancouver estimates that another 574,000 homes will be needed to accommodate all of those extra people. Enter the small housing unit. Land is at a premium in Vancouver, which is why basement suites and laneway houses have become so important to the city’s continued growth. So has increased density. Whether it’s fitting three dwellings on one single-family lot, or building towers and mid-rises with ever-smaller units, Vancouver is committed to packing more people into less space. In recent years, the City of Vancouver’s policies have promoted urban density: high-density neighborhoods where residents have easy access to work places, green spaces, shopping, and transportation. It’s the opposite of suburban sprawl, where residents usually make long commutes by car to get to work, or to shopping centres, spending time and money on transportation, and generating more greenhouse gases. One way to provide affordable homes is to make them smaller. Smaller houses or apartments cost less to build, and distribute infrastructure costs among a greater number of residents. In his book, Unlocking Home, Durning is especially enthusiastic about Vancouver’s laneway housing policies, since the city implemented citywide zoning. Image courtesy of Lanefab Design/Build. Vancouver legalized modern laneway houses in July 2009, becoming the first Canadian city to allow laneway houses on all single-family lots. Toronto, Montreal, and Victoria only allow laneway houses on a case-by-case basis. Vancouver’s adoption of such a wide spread infill housing policy allowed it to significantly increase density in areas traditionally reserved for single-family homes. The city also allows basement suites in all single-family homes—including those with laneway houses in the backyard—so there can be up to three separate residences on one lot. According to Durning, this “increased the city’s theoretical capacity for housing by 70,000 units.” Legally speaking, allowing tiny houses in backyards would be as simple as decreasing the minimum required size for laneway houses, which is currently 280 square feet. But the economics are more complicated. Building a tiny house of 180 square feet or less as a laneway house is not cost effective. Bryn Davidson estimates that even before construction starts, costs can run from $40,000 to $70,000 to pay for thing like permits and design. He should know. As co-founder of Lanefab Design/Build, his company designed and built the first modern laneway house in Vancouver in 2010. “So by the time you’ve paid that … you’re not going to put a 100 square foot building on [the lot],” he explains. Cost isn’t the only reason to build a bigger laneway house. Most people prefer the extra room. That doesn’t mean that tiny houses couldn’t find a home in Vancouver’s backyards: they’d just need to do it under specially created infill legislation. Accessory buildings under 107 square feet are exempt from the B.C. Building Code, and all utilities connect from the main house, making them much cheaper to build than laneways. But as it stands, minimum size requirements in Vancouver make them illegal to live in. The city would have to introduce a new zoning policy to legalize the tiny abodes, legislation that would probably come accompanied with building code requirements. A second option, popular among tiny house enthusiasts, is to allow mobile tiny houses in backyards as recreational vehicles. Property owners would only be responsible for supplying a parking spot, and R.V. hookups, while the renter would supply the tiny house. Living in R.V.s or mobile trailers is only legal in trailer parks, so this would still hinge on the city introducing new bylaws and policies. Terry Sidhu, co-author of the Small Housing B.C. case studies, says it could be affordable, if municipalities are willing to pre-zone the land, like Vancouver did with laneway houses. “It could be cheaper that way, but if it’s going to go case by case then I think you’d be just as good to build a laneway house,” he says. 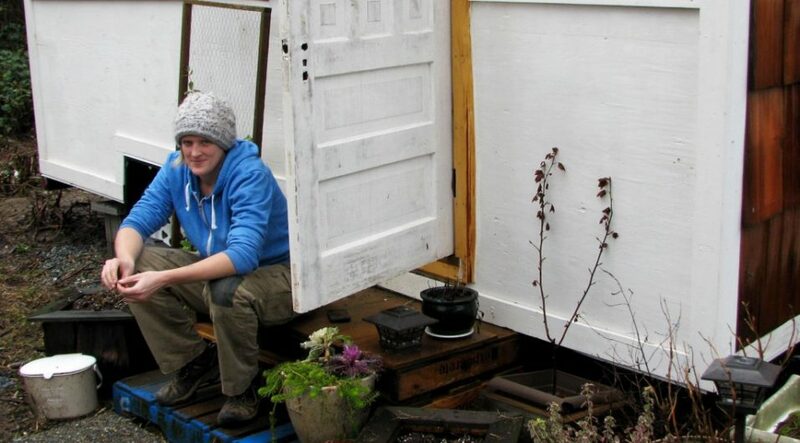 During the November 2014 municipal election, the Vancouver Green Party was the only party to include tiny houses in its affordable housing platform. Following the election, Green Party Councillor Adriane Carr confirmed that she plans introduce a motion on tiny houses sometime in the next four years. If the motion is successful—and given the makeup of council it may not be—Jackson and his staff would report back to council on how to set policies and guidelines for tiny houses in Vancouver’s neighbourhoods. Much like it did with micro dwellings in the Downtown Eastside.